Sarah Armstrong, left, barely edged teammate Kaleigh Hughes in an All-State meet. After dominating the indoor season in the shot put, Smith continued in the spring, winning not only the state title in the shot but also the discuss. In the shot she won Division 1 at 40-6, then won the All-State title at 43-11. The sophomore proved to be one of the top mile runners in the state, winning at All-States in 4:56.20 after finishing third at the Division 1 championships (5:01.97). The 2014 ISL MVP, Barron went undefeated in the 100-meter hurdles, the 400 and the 4x400 relay. She won ISL championships in all three events and set school records in the 100 and 300-meter hurdles. Barron will run track at Boston College next year. Bucknell dominated the javelin this spring, winning the State Coaches Invitational, Division 1, and the All-State meet. At All-States, she set a school record with a throw of 130-6. She was captain of the cross-country, indoor, and outdoor track teams. Craig was a top performer in the pole vault, taking home the Division 1 championship with her 11-3 jump. The senior finished the season at All-States, where she placed second in the state with a final jump of 11-9. Darsney finished as the top triple jumper in the state after placing first at the All-State meet (38-8). She set a meet record at the Division 2 championships with her 39-1 jump, and was runner-up in the 100-meter hurdles. DiMare was dominant at 200 meters, winning at All-States (24:75) after taking the Division 2 crown in 24:64. She also took the Division 2 100-meter hurdles (14.96) to contribute to Notre Dame’s first-place finish. DiPietro won the high jump with a meet-record jump of 5-8 at the Division 2 championships, 4 inches better than the runner-up, and repeated as winner in the event at All-States with a jump of 5-6. Duncan dominated the long jump, winning the Division 1 title (19-1), and then taking the All-State crown with a leap of 18-4.25 that helped the Falcons to a third-place team finish. Freda was unmatched in the 400-meter hurdles, winning at All-States (1:03.10) and at the Division 2 championships (1:03.12). The junior also helped contribute to Hingham’s win in the Division 2 4 x 400 relay. Godzinski helped lead North Reading to its Division 4 championship, contributing a win in the 100-meter hurdles (15.38) and a third-place finish in the triple jump (34-03). She also won the 100 hurdles at All-States (15.04). Irvin was the uncontested champion of the 400 meters, setting All-State and Division 2 meet records. She finished in 54.98 at All-States and 54.70 at the Division 2 meet. McNulty led the 2-mile by nearly 22 seconds at All-States, taking the title with her 10:48.98 finish. 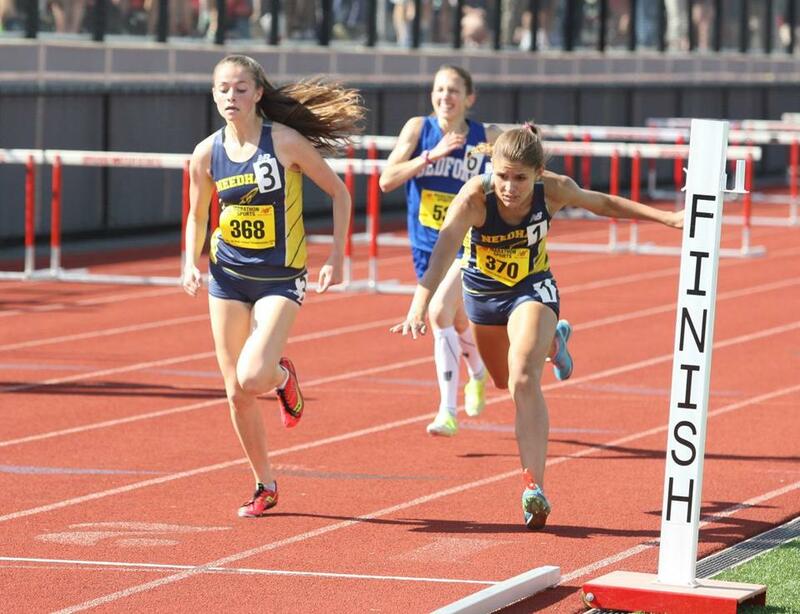 The senior was even faster when she won the event at the Division 3 championships, finishing in 10:38.76 when she placed third in the mile at the same meet (5:12.72). Scott remained number one all season in the 100 meters, establishing herself first as the Division 3 champion (12.45)in the event. The senior also took second place in the long jump in Division 3 (17’2.50) before going on to win All-States in the 100 (12.08). Shepard again ruled at 800 meters, setting records while winning at the Division 3 meet (2:13.12) and at All-States, where she shaved nearly six seconds off her time, finishing in 2:07.14. Taussig took the crown in the inaugural pentathlon event, winning the 100 hurdles, 800 run, and the shot put to finish with 2,767 points. She finished second in the pentathlon at the Division 1 championships with 2,512 points. After finishing second at the All-State meetin the shot put with a throw of 41-8.05, Umoren stepped it up at the New Englands, taking first place with a school-record 42-10. Umoren also won the shot at the State Coaches Invitational. When it mattered most, nobody could catch the Lions. Newton South won the All-State title led by senior Charlotte Huth, sophomore Lizzie Walkes, freshman Calene Lazare, and junior Yuriko Fukumura. The foursome finished in 48.83 to edge Cambridge. The group was undefeated during the Dual County League season and set the school record in the event. Huth, the lone senior, will attend Santa Clara University. The foursome of senior Maddie Oldow, sophomore Rachel Stier, junior Lindsay Goulet, and junior Mikaila Amerantes made their second straight All-Scholastic appearance after winning the All-State title in 3:50.14. The foursome also took first place in the Division 1 meet in 3:56.12. The four all earned Hockomock All-Star honors. Junior Morgane Butler, sophomores Ariel Keklak and Nicole Kerrigan, freshman Alexa Babick, and junior Sydney Clary won the All-State title in 9:17.17 after delivering a second-place finish in the Division 1 championships. A coach for 39 years, Tranchita has led his team to 22 league titles in the past 25 years. This season his team won its fourth state title in five years and their fifth straight relay title. Tranchita has been inducted into the MSTCA Hall of Fame. The former Globe (2007) and eight-time MVC Small School coach of the year is 40-1 in 10 years coaching, eight as the head coach. He led Tewksbury to a 4-0 regular season and an MVC Small title. Griffith led Wellesley to a 6-1 record en route to a Bay State Herget title. He is 34-7 in six seasons at the helm. This is the second Globe Coach of the Year honor for Griffith. In his 28th year as a coach, Martin led Norwell to runner-up finishes at the Division 4 championships and the Division 4 relays. Norwell (7-0) won the South Shore League despite having no track facility. Atlantic Coast — Dennis-Yarmouth: Olivia Adamaitis, Paris Jamiel, Tori O’Dea, Madison Pawlina, Kayala Ralston, Alexis Whatley. Falmouth: Alexa Johnson, Lily Joseph, Lauren O’Neil. Marshfield: Brianna deGrasse, Ellen DiPietro, Madie Lawlor, Kate Spitler, Kelsey Sullivan. Nauset: Coralea Geraniotis. Plymouth North: Jordan Callahan, Kate Fisher, Sophie Gorton, Alyson Jacobson, Jacklyn Sullivan. Plymouth South: Jayci Andrews, Leanna McKenna, Holly Sessler, Maddie Sessler. Sandwich: Elizabeth Wegman. Bay State — Brookline: Alia Buckner, Rhyana Freeman, Anya Gorodentsev, Allie Gregoire. Dedham: Unity Jean-Louis. Framingham: Kristin DeVellis, Savonna Small-Brown. Milton: Andrea Juzyca, Colette O’Leary. Natick: Kisha Kalra, Sarah Lagan, Kayley McGonagle. Needham: Sarah Armstrong, Margie Cullen, Kaleigh Hughes. Newton North: Angela DeNucci, Christina Galvagno, Maeve Greeley, Annie Greene, Kaila Hatcher, Candela Rubino, Michaela Smith. Walpole: Gina Conti, Allie Morris, Olivia O’Hara. Wellesley: Ally Isley, Emily Ryan. Weymouth: Meagan Deane, Kacie Higgins, Kelly Higgins, Kristin Leone. Big Three — Brockton: Celina Andrade, Ugochi Dike, Talia Halliday, Gayla Hunter, Patricia Mulinge, Nikayla Simpson, Faithe Yates. Durfee: Saja Sonallah. New Bedford: Ellie Bucknell, Lisa Chan, Raybryana Dasher, Kathleen Le, Damani Nascimento, Leslie Roda, Laura Vieira. Boston City — Dorchester: Tiana Daniel. Latin Academy: Britney Firmin, Ashley Lewis, Ashlyn Melvin, Leigha Mills, Imani Pressley, Catherine Van Even. New Mission: Ashley Guerrier, Da’Niel McFarlane. O’Bryant: Meryl Bantefa, Nisa Holley, Kalsie King, Juleen Lewis. Snowden: Maria Lewis. Cape Ann — North Reading: Cole Godzinski. Triton: Kerstin Darsney. Catholic Central — Archbishop Williams: Ruth Labranche, Jess Rega. Arlington Catholic: Nikki Doherty, Alexandra Kay, Stephanie Kelley, Olivia Liberti, Kaitlyn Maguire, Sarah Maimone, Serena McNary, Veronica Seguin, and Danielle Sheehan. Austin Prep: Stephanie Cassaletti, Elizabeth Lombardo. Bishop Fenwick: Jackie Edgett, Arianna Maida, Sydney Packard. Cardinal Spellman: Emily Ahlstedt, Ian Chester, Adrianna Forcucci, Meg Frazier, Molly Richardson. Marian: Andressa Andrade. St. Joseph’s Prep: Fatima St. Hilaire. St. Mary’s: Laris Bogmolov, Zuzu Haefner, Michaela St. Cyr. Catholic Conference — Fontbonne: Kayla Odegaard. Mt. Alvernia: Grace Jessiman. Notre Dame (Hingham): Elizabeth Baker, Callie Braudis, Elizabeth Constantino, Kendra Delahunt, Isabella DiMare, Marissa Gallotto, Elizabeth Kenneally, Taylor Kennedy, Gabby Kenyon, Tara LeVangie, Julia Marshall, Amanda Reilly, Gabby Sillari, Katie Steeves, Elizabeth Tevnan. Ursuline: Camille Kelley, Kristin MacNeil, Amy Piccolo. Dual County — Acton-Boxborough: Lee Al-Atragchi, Morgan Doan, Katrina Gerhard, Emileigh Glode, Sharon Kelmar, Lindsay Sweet, Abby Taussig. Bedford: Danae Bucci, Erin Dietz, Savannah Fox Tree-McGrath, Sabine Galvis, Nicole MacLellan, Olivia MacLellan, Oby Nwodoh. Boston Latin: Sarah Kiamie, Alannah O’Brien, Kaitlyn Pease, Mia Sheets. Concord-Carlisle: Kiersten Brady, Sarinnagh Budris, Margaret Giles, Julia Gregory, Caitlin Lawlor, Lucy O’Sullivan, Jhanel Potts, Emma Reichheld, Meredith Roberts, Meg Teitelman, Meg Wilson. Lincoln-Sudbury: Lucy Alexander, Alexa Babick, Morgane Butler, Sydney Clary, Ariel Keklak, Nicole Kerrigan. Newton South: Jina An, Alana Bojar, Yuriko Fukumura, Rebecca Grusby, Charlotte Huth, Calene Lazare, Clare Martin, Sabrina Stacks, Lizzie Walkes. Waltham: Shy Civil, Amanda Concetti, Eva Frimpong, Zhan’e Goode, Julia Kern, Katie Maehl, Olja Rapaic, Jenny Sexton. Wayland: Steffi Geiger. Westford: Stephanie Amato, Andrea Bert, Ashley Craig, Nicole Fondots, Alexa Popp, Rachel Vining, Claire Widmann. Weston: Read Allen, Patty Atkinson, Christiana Dryden, Jillian Howard, Emma Marlow-Benedick, Katie Marlow-Benedick, Brianna Schwartz, Zoe Snow, Clare Stephens, Mikaela Thompson. Eastern Athletic — Bishop Feehan: Adrianna Bruno, Hannah Bruno, Meredith Butler, Megan Carmody, Michaela Collins, Kim Cote, Sarah Gaughan, Maddie Harmon, Brynna Harum, Kerilyn Ingegneri, Molly Lahiff, Ann Leahy, Ally Luongo, Meghan Luongo, Abigail McNulty, Katie McNulty, Adrienne Santoro, Riley Scharland, Kate Svenson, Teresa Yoder. Bishop Stang: Theresa Gallagher, Elizabeth Sullivan. Coyle & Cassidy: Krista Fernandes, Alissa Piatelli, Victoria Tutino. Martha’s Vineyard: Olivia Smith. Somerset Berkley: Melissa Guirand, Hailey Monaghan, Cierra Torres. Greater Boston — Cambridge: Brianna Duncan, Sydney Fisher, Yemisi Gebenebor, Maya Halprin-Adams, Jordan Poindexter, Kenlee Presume, Mia Smith, Lucy Sternbach. Everett: Djenny Lorjuste, Sheryl Steeves. Malden: Carly Amos, Jacqueline Bouley, Kim Du, Carine Exume, Diamond Jones, Abigaille LeBlanc, Amalika Lucien, Joviana Morin, Taymise Sanders, Anne Woolley. Medford: Patricia Healion, Sara Volmar. Somerville: Kaba Alison, Melissa Baptista, Gabrielle Etienne, Brenda Nguyen. Hockomock — Canton: Rachel Campagna. Foxborough: Liz Holmes, Kayla Sepe, Haley Sykes, Katherine Tamulionis. Franklin: Beth Neal. King Philip: Ellery Lyons, Andrea Olson, Abby Seaberg, Olivia Weir. Mansfield: Mikaila Amerantes, Kelly Crawford, Jacqueline Dickman, Kelsey Ferreira, Caitlin Finnerty, Lindsay Goulet, Marissa Horn, Sarah Iandoli, Maddie Oldow, Sabrina Pray, Lauren Waters. Milford: Keilan Nova. North Attleborough: Melissa Beaupre, Annika Briggs, Kathryn Loughnane. Oliver Ames: Gabrielle Eldridge, Emily Flaherty, Christina Franciosi, Michaela Lievi, Olivia Mileika, Basia Osborne. Sharon: Mia Kamara. Taunton: Jessica Maki, Melissa Malcolm. ISL — Governor’s Academy: Mackenzie Gray, Katie Hanlon. Lawrence Academy: Salyna Anza. Milton Academy: Amanda Pasko. St. George’s: Sarah Carnwath. St. Paul’s: Malaika Ogukwe, Kerry Swartz, Samantha Yates. Thayer: Emily Barron, Julia Barron, Isabelle Dunne, Mary Goulding, Abby Osmanski, Kayla Rorke, Camille Sery-Ble. Mayflower — Holbrook: Brianna Hoffman, Jaliyah Jones-Robinson, Ceara Kelly. Sacred Heart: Bridget LeBlanc. Tri-County: Maddie Kaplan, Emily Spillane. West Bridgewater: Emma Cashman, Emma Kincaid, Devin McCarthy, Emily Quinn, Francesca Sheedy, Amanda Wells, Alison Wyman, Emily Yeo. Merrimack Valley — Andover: Erin Logee. Billerica: Nicole Kelly, Katie Mulkerin. Central Catholic: Madison Arndt, Taylor DePalo, Erika Johnson, Tiffany Simione. Chelmsford: Michelle Jaquint, MaryLou Ryder, Alexandra Wood. Dracut: Karina Shepard. Haverhill: Riley Gilmore, Kerrin Thomas. Lowell: Leyshla Gonzalez, Kaley Richards. Methuen: Wileshka Samuel. North Andover: Catherine Flaherty, Mary Lavery, Katie McManus. Tewksbury: Jess Amedee, Jess Ripley. Middlesex (Freedom) — Burlington: Shauntel Farland, Kaitlyn Gilberg, Erin Hardy, Valentina Lopez, Michaela Mazure, Stephanie McFadries. Melrose: Annalisa DeBari, Amani Ingral, Lilah Drafts Johnson, Ashley King, Shaylyn McCarthy, Anne Morrison, Haley Moss, Maddie Oro. Stoneham: Grace Macura, Lauren Olton, Kelsey Wojdakowski. Wakefield: Deidre Beck, Sarah Crump, Emily Hammond, Lucy Howard, Kelly Ledoux-Walsh, Shannon Quirk, Samantha Ross, Maggie Scanlon. Watertown: Keegan Duguay, Casey Halle, Leah Strangio, Katherine Tolman. Wilmington: Alex Bischoff, Kate Cowden, Julia Gake, Kelly Hartsough, Amber Peach, Christina Spinos, Siobhan Turner. Middlesex (Liberty) — Arlington: Abby Jones. Belmont: Rachel Berets, Julia Cella, Nairi Krafian, Julia Lenef, Maggie MacAulay, Kayla Magno. Lexington: Rebecca Anderson, Hanna Born, Paige Campbell, Alex Cox, Unsol Doh, Lucy Lang, Olivia Manickas-Hill, Hannah Neufeld, Reid Nichols, Becca Pion, Catheryn Pryor, Melissa Solomon, Jayika Taylor. Reading: Abby Allardi, Emily Allardi, Leah Angelini, Sarah Bond, Julia Driscoll, Kayla Raneri. Winchester: Tarvis Hintlian, Ellie Ward. Woburn: Sydney Ahern, Sydney Cassidy, Gina D’Addario, Alex DiMauro, Katie Murray, Jess Vining. Old Colony — Barnstable: Amanda Henson, Picabo Miskiv, Shaelagh Murphy, Amanda Remie, Morgan Richard. Dartmouth: Oriana Barthelmes, Skylar Barthelmes, Caitlyn Demers, Frances Pontes. Patriot — Hingham: Katherine Freda, Sierra Irvin. North Quincy: Maya Umoren. Tri-Valley — Ashland: Alyssa Zee. Dover-Sherborn: Michelle Alessandro, Claire O’Callaghan. Holliston: Sydney Snow, Madison Ward. Hopkinton: Shelby Aarden, Lauren Hazzard, Autumn Kramer, Jessica Scott. Medfield: Payton Ouimette. Millis: Taylor White. Norton: Kassidy Campbell, Shannon O’Rourke, Brooke-Lyn Williams. Westwood: Phoebe Fitzgibbon, Rachel Morrison.